I’m all for caution, but this just makes me cringe. At St. Agnes Roman Catholic Church in Clark, N.J., parishioners no longer handle the communion wafers that they once transferred from one bowl to another at the start of Mass. 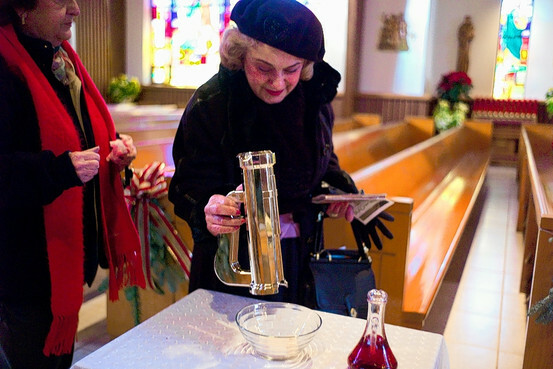 Instead, parishioners use a very untraditional looking contraption known as a communion host dispenser. They pull a trigger and wafers are deposited into a bowl for consecration during the Mass. “There was a big concern about germs on the hands getting on stuff so we use the dispenser instead,” said the Rev. Dennis Cohan. A Christmas hepatitis scare at a Long Island church has church officials across the region once again examining health and hygiene issues. Basics like using hand sanitizer and refraining from shaking your neighbors’ hand or sipping from the communion cup if you are sick are being reinforced. The Nassau County Department of Health announced on Monday that an individual diagnosed with the hepatitis A virus was involved with distributing communion at two Christmas Day services at Our Lady of Lourdes Church in Massapequa Park.